The man instrumental in a White House move to deport John Lennon in 1972 now heads McCain's transition team. The man John McCain appointed to head his transition team, William E. Timmons, played a central role in the Nixon Administration’s campaign to deport John Lennon in 1972. At the time–spring of 1972–the war in Vietnam was going strong, Lennon was living in New York City and had become a prominent antiwar voice, singing Give Peace a Chance and Imagine at antiwar rallies and concerts. 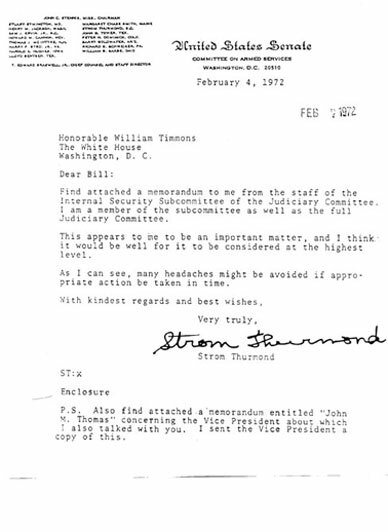 The information Thurmond sent to Timmons was correct–it came from the staff of the Senate Internal Security Subcommittee, of which Thurmond was a member. 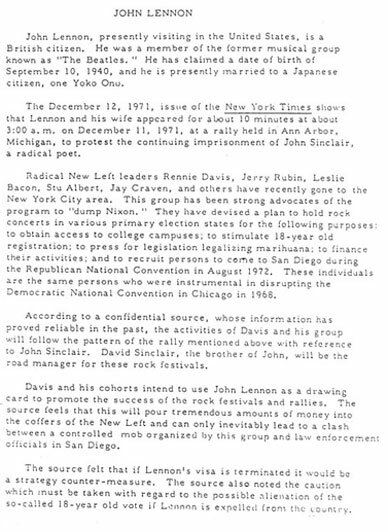 Lennon and his new friends Jerry Rubin and Rennie Davis, who four years earlier had organized the 1968 antiwar protests at the Democratic National Convention in Chicago, were planning a concert tour to mobilize young people to vote in the upcoming election. Of course registering young people to vote was not a crime–but the Republicans were concerned about the “youth vote,” since 1972 was going to be the first election in which 18-year-olds had the right to vote, and it was widely assumed young people were mostly antiwar and thus anti-Nixon. Nixon’s effort to deport Lennon never succeeded. In the end, Lennon stayed in the United States while Nixon left the White House, resigning in the Watergate affair. But Lennon did curtail his antiwar organizing during the 1972 campaign, on the advice of his immigration lawyer, Leon Wildes, who told him not to do anything to further antagonize the Nixon people. Timmons left the White House shortly after Nixon’s resignation and founded his own lobbying firm. In 2008 he was registered to represent the American Petroleum Institute, Visa USA, Anheuser-Busch and Freddie Mac. He’s also worked with virtually every Republican presidential campaign, starting with Bob Dole. McCain’s selection of Timmons ties the candidate to Nixon’s dirty tricks and enemies list. Nixon’s campaign to deport John Lennon was an example of White House abuse of power–the use of the power of the president to punish those who criticized him or opposed his policies. 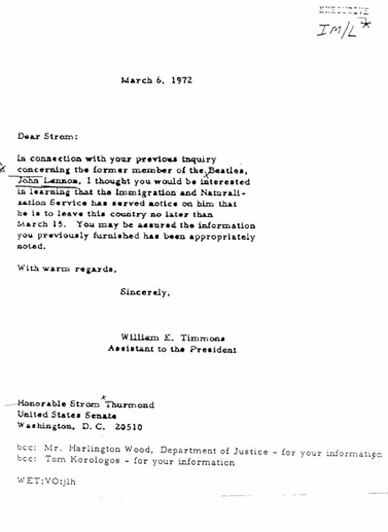 The Thurmond-Timmons documents were first published in Rolling Stone, July 31, 1975.